From Florence: A1 to Rome, exit at Val di Chiana, direction Perugia. Take the highway to Perugia and follow the direction to Cesena. Continue until you find the exit Valfabbrica. Once you arrive at Valfabbrica go ahead to Gualdo Tadino Ancona. 6 Km from Valfabbrica on the left you will see the sign "Agriturismo La Coccinella", after 200 m you will arrive. From Rome: A1 to Florence, exit Orte (TR). Take the direction of Perugia and continue until the exit for Cesena direction Valfabbrica. Continue until you find the exit Valfabbrica. Once you arrive at Valfabbrica go ahead to Gualdo Tadino Ancona. 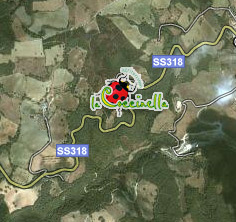 6 Km from Valfabbrica on the left you will see the sign "Agriturismo La Coccinella", after 200 m you will arrive.